With the onset of the school year, the proliferation of head lice infestations grips communities nationwide. Yearly, more and more news outlets are highlighting the evolution of “super lice” or “superbugs”, called so because they are immune to most common anti-lice products. In past reports, articles on super lice across social media like HealthDay state that over 25 states host head lice populations that don’t respond to common over-the-counter treatments. But, as head lice populations evolve to protect themselves from lice-removal, the good news is that super lice are still very easily and thoroughly eradicated if handled properly and at lower cost than most chemically-based products or prescription remedies. O.C. 's Hair Police, an Orange County based head lice-removal company, says their Non-Toxic Absolute Clear proprietary enzymes is one of the few sure-fire ways to protect schools and children from head lice outbreaks. Absolute Clear is derived from naturally occurring enzymes. The human head louse cannot become resistant to natural enzymes EVER because the enzymes break down the exoskeleton of the louse versus attacking the nervous system. The nervous system incorporates the ongoing evolution of specific genes within the head louse gene pool to ultimately develop the necessary resistance in order to solidify its existence. The skeletal structure of the head louse cannot do the same to ward off its destruction by natural enzymes. Absolute Clear is a non-toxic, non-abrasive, and hypoallergenic mix. These naturally occurring materials are combined with surfactants and other biologically stimulating ingredients. Further, the enzymes are successful in loosening the glue that attaches the nits to the hair shaft thereby eliminating their viability by moving them away from the scalp and necessary heat in order to incubate and ultimately thrive while making their removal much easier. For more information and validation of HealthDay’s claim, http://www.PubMed.gov, US National Library of Medicine National Institutes of Health provides the following information on the evolution of Super Lice. 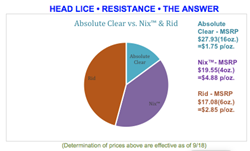 In simpler terms, a chemically based OTC and/or prescription head lice remedy will fall into the above category of being 88% ineffective. This is true due to the fact that human head lice have developed nearly complete “fixation”, or resistance, to the pyrethroid insecticides placed in OTC and/or prescription remedies for the purposes of combating a head lice infestation.